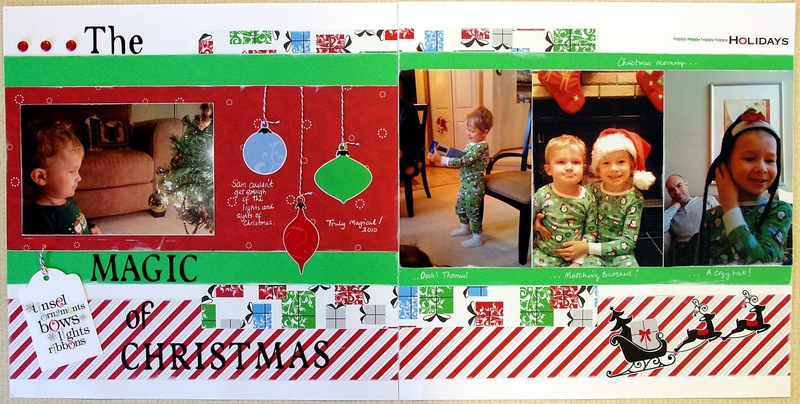 When my husband and I got married I started a "McAllister Family Christmas" Album with the idea that I would add a few pages to it each year to highlight our holiday celebrations (read more about my album here). It has been a wonderful album to create and enjoy. It is always accessible on our album shelf, but I bring it out at Christmas time and place it on the coffee table for everyone to look at. My boys love to flip through it, and I love to see how they have grown and changed over the years. I also think its fun to see how my scrapbooking style has evolved over the years! The patterned papers, cardstock stickers and clear title/word stickers that came with this CM kit were super cute on their own, so I just added some solid cardstock in coordinating colors, white craft ink to highlight the edges and some bakers twine to complete the layout. I love using sketches (I call my own sketches "Page Plans") for quick layouts as well as the basis for more decorative pages. You can do as much or as little as you want to the layout and you know it will be beautiful.